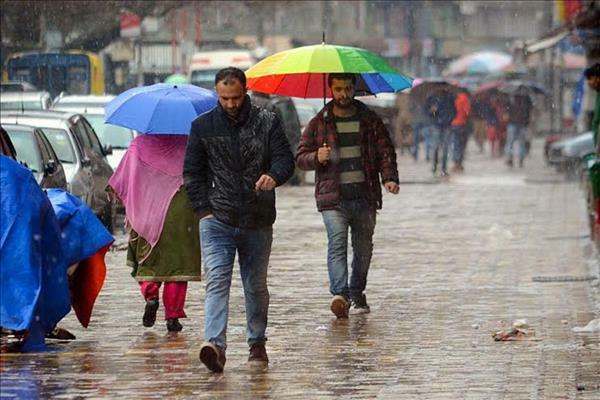 (MENAFN - Kashmir Observer) SRINAGAR — Weatherman on Monday forecast moderate to rather heavy rain and thunderstorms over the state of Jammu and Kashmir from tomorrow to April 18. He said that Srinagar—the summer capital of Jammu and Kashmir - recorded a minimum temperature of 8.0 degrees Celsius last night against 7.6 degrees Celsius normal for this time of the season. The official said that Qazigund, the gateway town of Kashmir recorded a low of 8.2 degrees Celsius while the mercury in Kokernag town in south Kashmir settled at a low of 6.1 degrees Celsius while Kupwara town in north Kashmir registered a minimum of 6.5 degrees Celsius. Gulmarg, the famous ski-resort in north Kashmir, witnessed a low of 1.5 degrees Celsius while the famous health resort of Pahalgam recorded a minimum of 2.8 degrees Celsius. The traffic on the strategic Srinagar-Jammu Highway resumed after remaining suspended for over seven hours due to a massive landslide in Ramban district Monday, officials said. Over 1,000 passenger vehicles and 1,500 trucks were left stranded on the highway, the only surface linking Kashmir with outside world, after a landslide blocked the arterial road at Digdol around 11 am, the officials said.